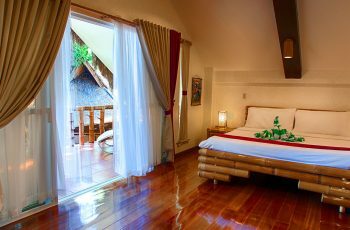 The 10 standard air-con bamboo cottages a located on the rear portion of the resort. All rooms come with a balcony offering a nice view over the beautiful garden in the center. 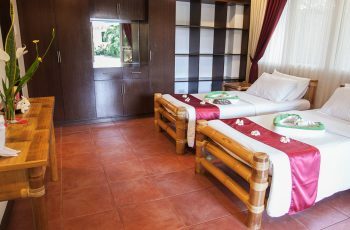 The two single beds can be arranged into one matrimonial bed but there are also 3 standard rooms with a King size double bed. Furthermore, a small cable TV, mini-bar refrigerator, in-room safe, and a coffee & tea making facility can be found in each room. All bathrooms are tiled and feature hot & cold shower for your convenience. Perfect for Diving. 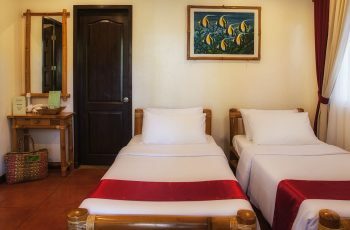 The guestroom is clean and cosy, and staffs there are both friendly and helpful. Inside the resort there is a dive center, which is able to provide anything you need for diving. This place is suitable for divers who wish to go diving in Dauin and Apo Island.